Visiting teacher, Rev. 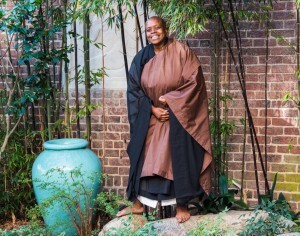 Zenju Earthlyn Manuel, of Still Breathing Zen Meditation Center in Oakland, will lead our meditation and offer dharma talks during this special one-day sitting. Rev. Zenju was ordained by Zenkei Blanche Hartman Roshi and received dharma transmission in January 2016. As an author and ordained Soto Zen Buddhist priest, she combines Zen meditation, intuitive knowing, and indigenous wisdom in a path of liberation. Her teaching theme for the day will be Shinzo: Ever Intimate. The term Shinzo refers to the practice of not rejecting either delusion or enlightenment; being “ever intimate” with the experience that comes our way. Register here.